The Talos II your humble editor is typing this on is probably pretty middling-spec by most of your standards, but it does the job. 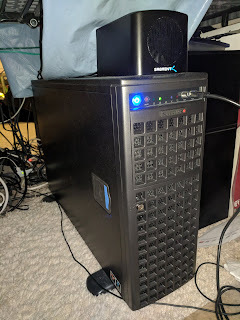 From the "factory" it came with two 4-core POWER9 CPUs, 32GB RAM, Radeon WX7100 workstation card, LSI RAID PCIe card, 4-port SATA PCIe card connected to an LG BD-RAM drive, and 500GB Samsung 960 EVO NVMe main storage, all in the standard Supermicro case Raptor is currently shipping. Since then, we swapped out the LSI RAID card for another 960 EVO NVMe, this time 1TB (we'll populate those front bays sooner or later, tho), and added a Rosewill RC-504 PCIe FireWire card for video work. That takes care of all the slots we have available and both new installs were immediately detected and operable in Linux. For sound we added a Sabrent AU-MMSA USB audio dongle (the Aten KVM switches sound sources, too), which "just worked" in Fedora, and to read our old hard disks from the Mac a Sabrent EC-HDFN dual 2.5"/3.5" SATA docking station connected over USB 3.0. This unit also "just worked" with no specific setup and has a nice disk-clone feature as well. Lastly, for noise reduction, we replaced the factory Supermicro PWS-1K41P-1R power supplies with PWS-1K41P-SQ "super quiets." These are also 1100/1400W-rated PSUs of the same specification, and while they were a little hard to source, were so worth it; they're just about whisper-quiet. The Talos II makes hardly any noise now even under load and long uptimes. What's your rig running? All Talos-family systems are eligible. Tell us at talospace at floodgap dawt com. Please, don't send photos until we're ready for them (unless you have them hosted somewhere). Cool loadouts will appear in future episodes of Show Us Your Talos. Is there a tiny Talos in the timeline?